Dhirubhai Ambani 28 December 1932 6 July 2002 Indian Hirachand Gordhanbhai Ambani Jamnaben Entrepreneur, Business magnate Indian business tycoon and founder of Reliance Industries in Bombay with his cousin. The combined fortune of the family was $60 billion, making the Ambanis the third richest family in the world. 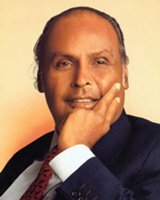 A list of popular dhirubhai ambani quotes are given below.